Please note: This DapperLads product is no longer available for sale here - after almost 20 years, DapperLads has left the online universe - we appreciate your support over the years - thank you for your patience and understanding! Maybe the perfect choice for ring bearers! Versatile and stylish to create your theme as this set works well for outdoor occasions and country themes and also more traditional or vintage wedding themes. 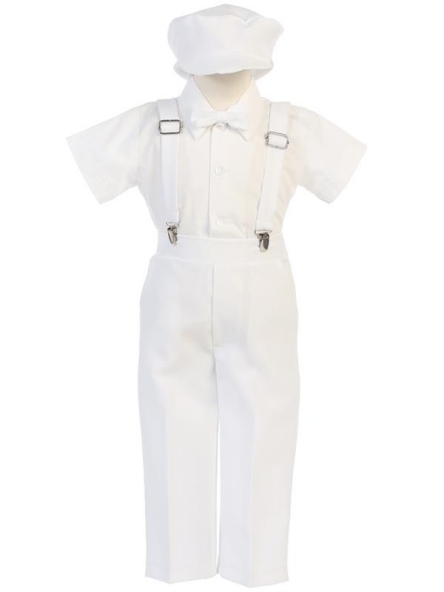 This 5 piece set includes a white cotton-poly dress shirt, white polyester dress pants, bow tie and hat plus matching suspenders. Better brand. US made by Lito. Machine washable. Spot clean the suspenders. Runs on the small side. Order up a size if unsure. Refer to the general size chart. Customize the look to your colors with bow ties and/or suspenders - sold separately in accessories.